When you have tools as useful as Views and Panels 3, you'll want to be able to use them together. To figure out how to use them together, let's create a new front page. 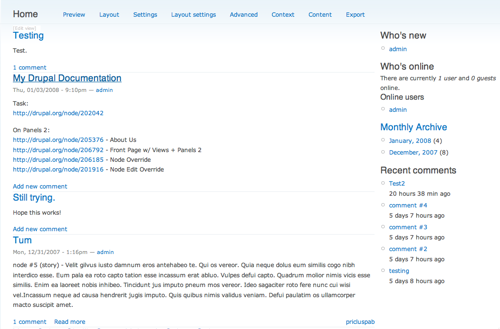 Drupal's standard front page is useful, but we want something a little more. Please note that the screenshots are from Panels 2, but are similar to Panels 3. The first thing to do is make sure you have both Views and Panels 3 installed. You don't need all of the Panels modules, but it's easiest to enable them all at once. The next step is to create the views we'll need. The first one we need, the front page view, is a sample view that comes with Views. Let's enable that. Click Views (Site Building > Views). This brings you to the Views management page. On the bottom, under the 'Default Views' heading, find the 'frontpage' default view, and click 'Add'. Note that this screenshot is for Views 1; the Views 2 screen is different, but the frontpage view is still available. Views 2 has an 'archive' view provided by default. Simply enable it. Now, to create the panel. Click Panel pages (Administer > Site Building > Panels > Panel Page). Click 'Continue' at the bottom. Let's select the 'Flexible' layout, which allows us to create our own layout. The 'Layout settings' tab that you are brought to looks intimidating, but we're just making a couple changes. One of the benefits of selecting a flexible layout is being able to easily manipulate your panel to have any kind of configuration. Now, we want some custom dimensions for the panel, so we'll need to invole the Layout designer. Click the "Show Layout designer" button. In the Region menu, select Region settings, and change the region title to "Left". Move up a 'box' to the row. In the Row menu, select "Add region to right". Title this region "Right". Use the slider bar to set the width to 80 on the left, 20 on the right. Now we need to add a menu item. Click the 'Menu' tab on the left. Click the checkbox next to 'Normal menu entry'. Set the Weight to: -10 and the Title to 'Home'. Click 'Update' at the bottom. Click the 'Content' tab on the left. Click the gear icon in the left pane. Under the 'Views' heading, find and select the 'frontpage' view we added earlier. Click the checkbox next to 'Link title to view'. Click the checkbox next to 'Provide a "more" link that links to the view'. Click 'Finish' at the bottom. Click the gear icon in the right pane. Under the 'Activity' heading, find and select 'Who's new'. Under the 'Activity' heading, find and select 'Who's online'. Under the 'Views' heading, find and select 'archive'. Use the block display. Under the 'Activity' heading, find and select 'Recent comments'. Now, one last thing to do; we still have to make our front page the front page. Go to the 'Site information' menu (Administer > Site configuration > Site information). Click 'Save configuration' at the bottom. Click the 'Home' menu item we added on the menu. Voila, we have overriden the front page with a panel!